The “Eat Smart Little Chef” interactive food education program aims to bring a fun day for kids to learn about healthy diet through various creative activities. On 20 September, 10 children joined us visiting Jamie’s Italian, learning the culture and ingredients of Italian cuisine. After the restaurant tour, children started preparing their own vegetables pasta salad. It was their very first cooking experience and they did a brilliant job! The group then moved to another unique landmark, the Asia Society Hong Kong Center. This hectare site is the former British military buildings and the main usage of it was for explosives and ammunition production and storage. The children and their families were happily enjoying a tour hosted by Vicky and learning all the historical background of the site. They were then visiting the Chantal Miller Gallery and having a private tour to see the latest art exhibition, “Bat Cave: Treasures of the Day and Creatures of the Night”. What an unforgettable experience for kids! In the afternoon, we started our very own food education activity. Children learnt the 5-a-day concept from the characters of “Inside Out”. Then draw their food hero and started making their handcrafted on the traditional lantern. The mid-autumn festival (27 September at 2015, vary every year), is a day for family and friends coming together, or harvesting crops for the festival. Yet, for kids, it is a special time once a year to carry their own lantern and going to the park to have fun with other kids after the family dinner. We hope they will pass on the 5-a-day message to other kids with their lantern as well as to help the family to choose some healthy ingredients for the dinner on the day of the mid-autumn festival. 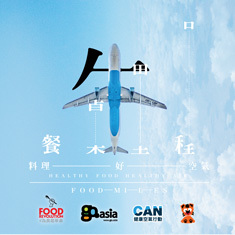 A special thanks to Jamie’s Italian Hong Kong, Asia Society Hong Kong Center and H.K.S.K.H. Holy Carpenter Church. 健康擇食小廚神 是由Go.Asia 創辦的一日互動健康飲食教育項目，不但為孩子帶來快樂的經驗更從活動中學習健康飲食的重要。上星期日 (9 月20日)，我們帶領10 名5-10歲的學童於早上參觀Jamie’s Italian餐廳，讓他們認識意大利的食材及飲食文化。之後他們學習製作意粉沙律，拿起餐刀切甘荀、小番茄、甜椒等食材，大部份小朋友也是首次入廚，大家表現相當興奮，還把平日不吃的甘荀全吃掉。他們也實在太乖巧了!